Cafe Zoe is no more. I spoke to Jennifer Le, one of the new owners who took over Cafe Zoe three months ago and have since moved forward with a three-week renovation, reopening as Brooklyn Bagels last week. 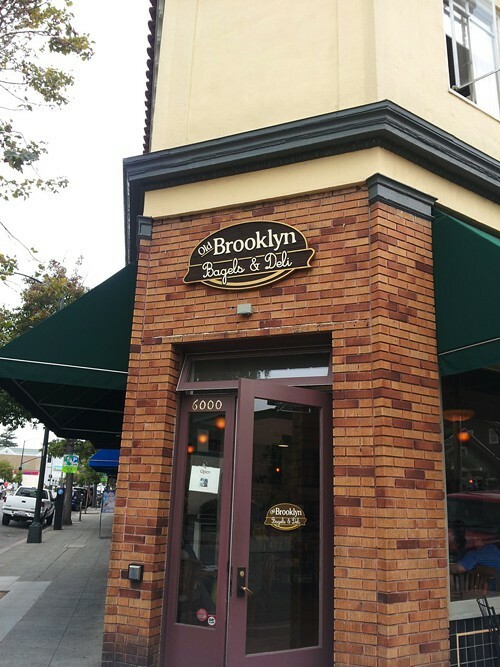 Le explained that the new venture is owned by a corporation — the same people who own Emeryville’s Emery Bay Cafe. You set up certain expectations when you put “Old Brooklyn” in your name, but Le qualified any claims about authenticity by saying that what they’re doing is more of a fusion: “East Coast meets West Coast.” So, for instance, their fairly extensive sandwich menu includes a fairly standard corned beef Reuben, but also something called the Napa (a BLT with avocado) and another sandwich they’ve dubbed the Santa Cruz (with roasted veggies). When I paid a visit to the cafe, the only thing that struck me as “Brooklyn” about the place were some black-and-white photos of the borough on the back wall and the presence of menu items like whitefish salad (made in-house) and sandwiches that feature pastrami and corned beef (neither of which is made in-house). It’s not an old-fashioned Jewish deli by any stretch. Nevertheless, the cafe has a bright, airy interior, and the tables are nicely spaced out so the place doesn’t feel crowded even when full. Most of the employees appear to be high school or college students on summer break: friendly folks. According to Le, the partnership with Authentic Bagel Company didn’t work out because the Scott brothers were more focused on their wholesale business than in running a retail store. When I asked Jason Scott about this, he told me he and his brother had been prepared to stop expanding Authentic Bagel Company’s wholesale operation, but that the Cafe Zoe partners wanted them to drop all of their existing accounts as well — something the Scotts weren’t willing to do. He also cited various philosophical differences with respect to “standards of quality and ingredients.” Not quite fighting words, but it seems the split wasn’t exactly amicable. For her part, Le said the Scotts just seemed more interested in perfecting their bagel recipe; they weren’t ready to commit 100% to the retail side of the business. 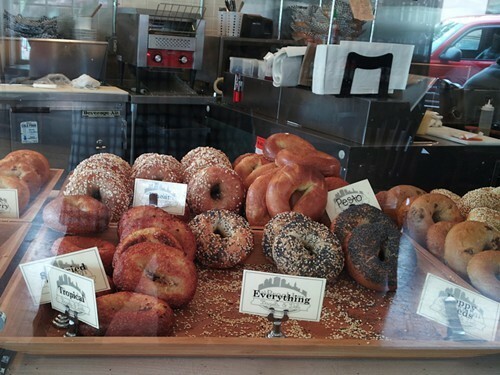 As far as the bagels at Old Brooklyn Bagels are concerned, Le said the shop developed a new recipe after splitting with Authentic Bagel Company. They didn’t hire a specialized bagel maker, but brought in someone from outside to train the baker they already had. I tried a couple of the bagels and thought they were okay — just don’t go expecting something you’d find in Brooklyn. For one, there are quite a few wacky, non-traditional flavors: pesto, orange-cranberry, Asiago cheese, and so forth. There’s a “tropical” flavor that I assume is the one Le mentioned had mango, pineapple, and coconut when I spoke to her on the phone. Without being too dogmatic about it, I’m generally not too interested in that kind of thing. On the other hand, the plain bagel I tried had a smooth exterior skin and a dusting of cornmeal on the bottom, and was very sweet — almost Wonder Bread sweet. The bagel’s interior was also fairly soft and bready — not dense like a true New York bagel. On a positive note, the Old Brooklyn bagels did taste pretty fresh and had a more appealing texture when toasted. According to Le, Old Brooklyn Bagels & Deli’s grand opening will be next Wednesday, August 8. They’ll be running a few promotions that day — a free cup of coffee with the purchase of a bagel, that kind of thing. For now, the cafe’s hours are 7 a.m. to 7 p.m. They’re still in the process of getting a website set up, but you can follow the shop on Twitter.